Admissions at Saint Michael's College are generally open to applicants--in 2016, the acceptance rate was 77%. Students can apply using the Common Application, or the school-specific application. Applicants will also need to submit high school transcripts, and a writing sample/personal statement. Saint Michael's is test-optional, so applicants are not required to submit SAT or ACT scores, although they can submit them if they'd like. For more information about applying, be sure to check out Saint Michael's website, or contact the admissions office. 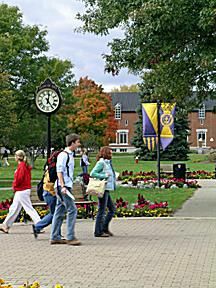 Saint Michael's College is a private Catholic liberal arts college located in Colchester, Vermont, just outside of Burlington. The college does well in rankings of national liberal arts colleges, and the school's strengths in the liberal arts and sciences earned it a chapter of the prestigious Phi Beta Kappa Honor Society. Undergraduates come from 33 states and 13 countries, and students get lots of personal attention thanks to the college's 12 to 1 student / faculty ratio. On the athletic front, the Saint Michael's Purple Knights compete in the NCAA Division II Northeast Ten Conference. Popular sports include basketball, soccer, skiing, track and field, hockey, swimming, tennis, and softball.